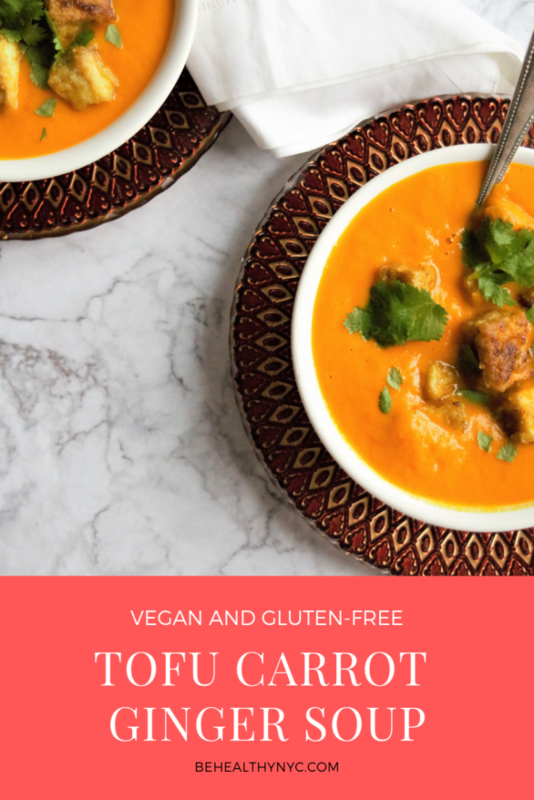 This vegan carrot-ginger soup with tofu is amazing! 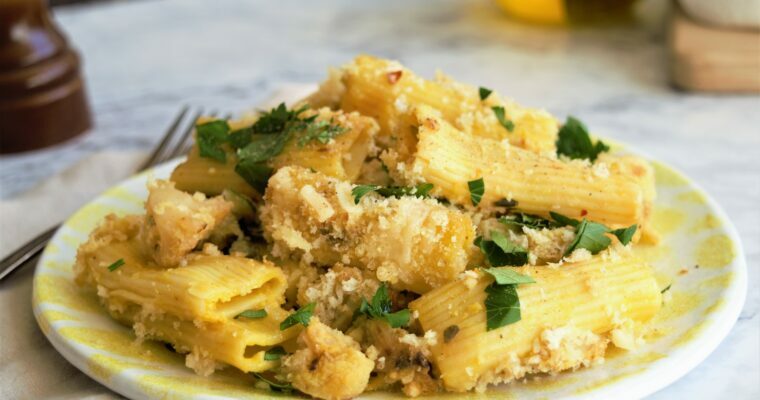 I made this recipe last week from an old Food Network Magazine. It was exactly what I needed: a light dinner, low-carbs, and calories, and high protein. 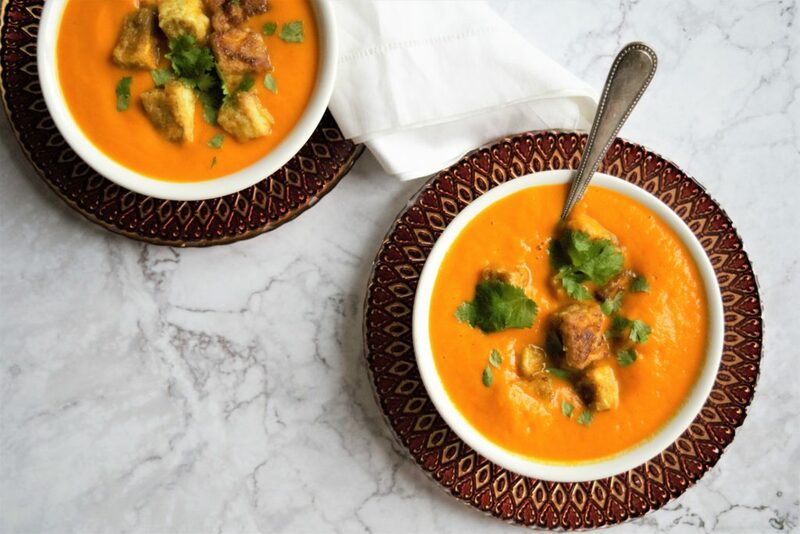 What I love the most about this vegan soup is the contrasting textures, while the soup is silky smooth, the tofu is crispy. 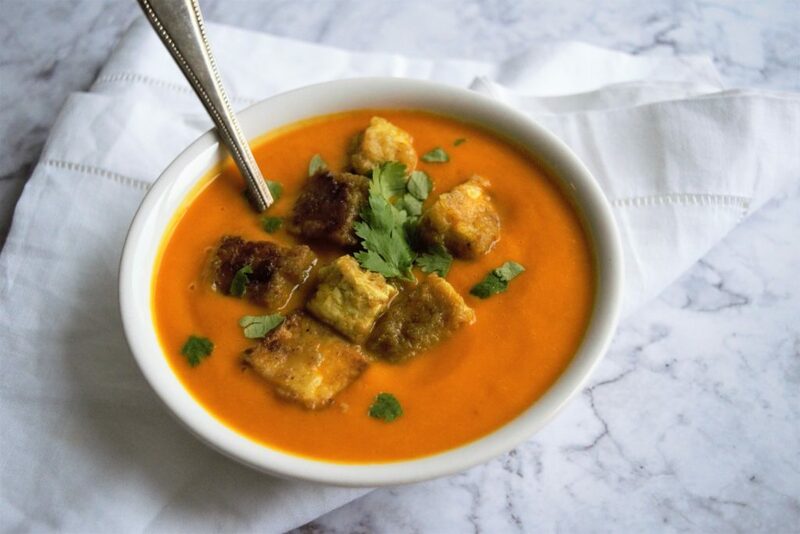 I never thought of adding pan-fried tofu to my soup! Usually, I make a homemade cashew sour cream, or fry some sage leaves, or add some toasted pumpkin seeds. But now this curry pan-fried tofu is officially one of my soup toppings. 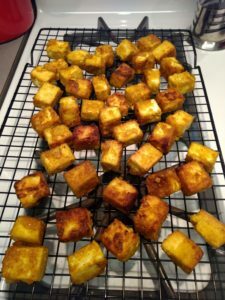 If you don’t like curry, there are many different ways to season the tofu. 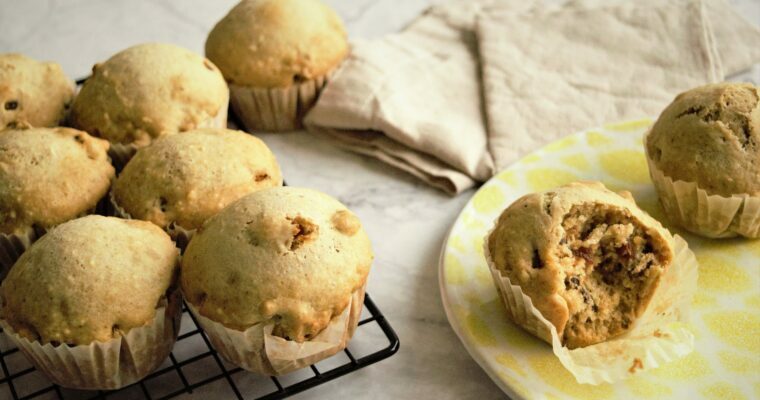 You could add turmeric powder, or cumin, or ginger powder, or any seasoning you like. Vegetable juices are great for adding flavor when cooking for vegetarians. 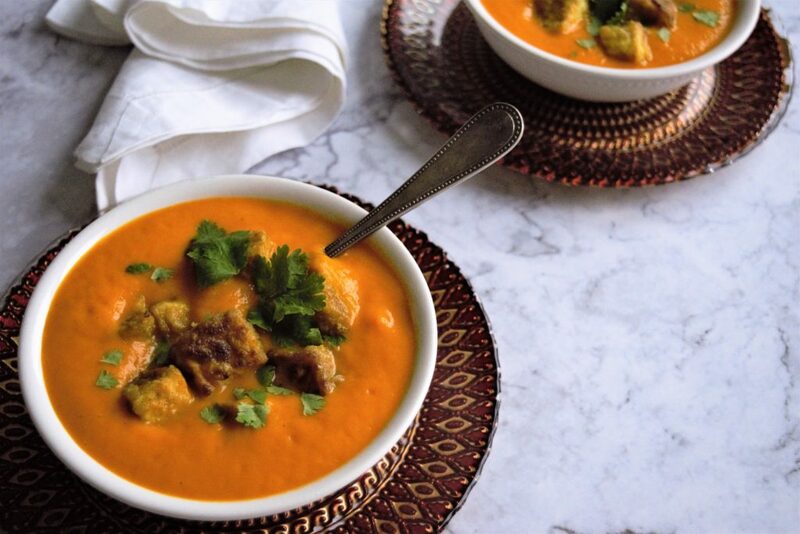 Try carrot or tomato juice in curries, soups, and stews. I used my amazing Green Star Juicer, but you can buy any carrot juice, just make sure it is 100% pure. Heat 2 tablespoons vegetable oil in a large pot over medium heat. Add the carrots, onion, and ginger and cook, stirring, until the vegetables are just soft, about 5 minutes. Season with salt and pepper to taste. Add the star anise, carrot juice, and 3 cups water, then cover and boil until the vegetables are tender about 20 minutes. Meanwhile, cut the tofu into 1-inch cubes. Mix the cornstarch and curry powder on a shallow plate and season with salt. Pat the tofu dry and roll it in the cornstarch mixture. Heat the remaining 6 tablespoons oil in a large skillet over high heat. 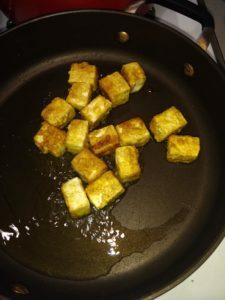 Add the tofu and fry, turning, until golden and crisp on all sides, about 5 minutes. Drain on a paper towel and season with salt. Discard the star anise. Transfer the soup to a blender and puree in batches (or keep it in the pot and use an immersion blender). Thin with water, if necessary, and season with salt and pepper to taste. 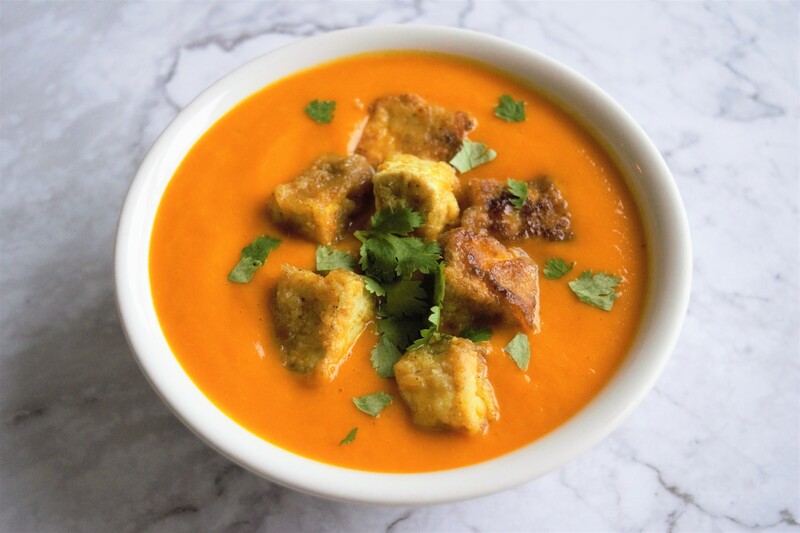 Ladle into bowls and top with the fried tofu. Sprinkle with chopped cilantro.